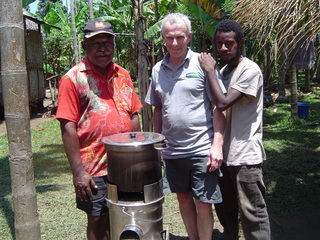 Paul McFarlane developed the Rocket Two-In-One designed to boil water and provide a variety of cooking options within a single unit. The unit is fuel efficient and you can use scrap timber, dung, wood pellets or any reasonable flammable material. A prototype was designed and trialled in New Zealand and in Papua New Guinea where it was met with great success as a practical and working model. The Rocket Two-In-One was initially developed for poorer countries to alleviate open fire cooking which is inefficient, and also to provide clean water and cooking facilities in response after a natural disaster ,world unrest, refugee camps and generally providing better cooking options in those countries that need help. But since then it has shown wide appeal as a general cooking apparatus for camping and outdoor activities. After spending one month in Papua New Guinea in 2013 I came back to New Zealand looking to see how I could help the people of PNG, Pacific islands and other world countries in their daily life. Watching the women cooking three times a day on the ground wasting wood with a fire too big for their pots I came up with the idea to produce stainless steel rocket cookers and with the help of another local company we have designed this unit with a water jacket so while cooking it boils the water for safe drinking which also makes this unit ideal for natural disasters around the world or where the water quality is not ideal for drinking until boiled. The cooker is also great for camping & hunting: it is fueled by small bush sticks in the base unit which holds approx 12 liters of water, when the fire has been started you can then put your pot, frying pan or wok on the top of the cooker. 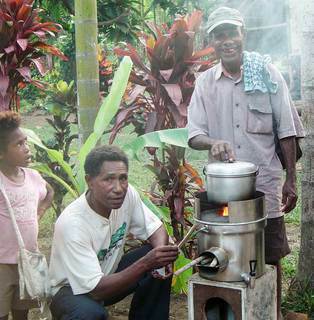 This cooker uses very little wood, I have done a PNG boil up using taro, banana, chicken etc. and cooked this for two hours and used approx 1.4 kilo of sticks feeding 7 people. Four liters of water in a pot on top of the cooker will boil in 15-20 minutes. The small amount of wood required to fuel the cooker will result in less wood that people will have to go searching for and once the water is boiled it will give everyone safe clean drinking water. I am genuinely wanting to help people in their daily lives thus we have kept the price very low a retail of NZ$149.00 (GST inclusive) making these more affordable to those in need of the Rocket Two In One. The Rocket Two-In-One is also a great product for any company wanting to donate to any charities as your name/logo can be etched onto the cookers. Special rates are available for Governments, Aid Agencies or companies on bulk buying.